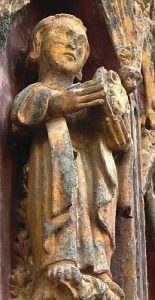 Edburga was the only daughter of King Centwine and Queen Engyth of Wessex, the 8th century royal family of Kent, England. She became a Benedictine nun of the Minster-in-Thanet Abbey in 716 where she became a friend and student of Saint Mildrith, whom she eventually succeeded as Abbess. During her time as an abbess she was able to secure royal charters for the abbey as well as having a new church built there, to provide a shrine for the relics of St Mildrith. Edburga was a skilled scribe and calligrapher. She made a pilgrimage to Rome, where she met Saint Boniface, with whom she established a lengthy correspondence. Her letters have not survived. She supported Saint Boniface in his missionary work, and copied manuscripts for his use. Edburga died of natural causes at Minster-on-Thanet in 751. Saint Edburga, inspire us to help our missionaries overseas. A noblewoman from Constantinople, she was wed to Nebridius, a prefect of the city. Widowed within a short time, she refused to remarry even at the behest of Emperor Theodosius who, in punishment, placed her extensive wealth into a trust until she turned thirty. She was already devoting herself to the needs of the poor and, after the restoration of her estate in 391, she became a deaconess. With several friends, she founded a community of perpetual virgins. Olympias built a hospital and an orphanage, and she sheltered monks. Her gifts and donations to the poor were so extensive that John Chrysostom objected and became her spiritual director. A friend and defender of John during his severe troubles, she protested his exile in 404 and refused to accept his appointed successors. As a result, her community was fined, severely persecuted by imperial and Church officials, and finally disbanded. Throughout, she received encouragement from John in his place of exile. She was herself finally exiled and died in Nicomedia barely a year after John’s death. 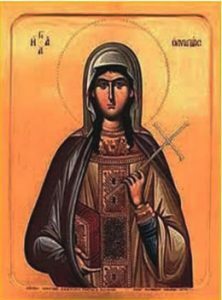 Saint Olympias, give us the courage to stand up for what we believe is right. Youssef Kassab Al-Hardini was born in Hardin, Lebanon. As a child, he was strongly influenced by the monastic tradition of the Maronite church. He entered the Lebanese Maronite order in 1828. He began his religious life at the monastery of St Anthony in Qozhaya, and was given the name Nimatullah. During his novitiate, he deepened his life of personal prayer and dedicated time to manual labour, learning to bind books. He was especially noted for his love of the Blessed Sacrament. During his free time, frequently at the sacrifice of sleep, he was often found in the chapel on his knees, arms raised in the form of a cross and eyes fixed on the tabernacle. In 1830 he made his profession and was sent to the monastery in Kfifan to study philosophy and theology prior to his ordination in 1833, after which he became director of the scholasticate and a professor. He served as Assistant General of the Order for three terms, but refused to be appointed Superior General. “Better death than to be appointed Superior General,” he is reported to have said. His reluctance to assume positions of authority stemmed from his deep humility and his earnest belief that he failed to live in continuous contact with God, so necessary to serve properly the monks and the Order. In December 1858, while teaching at the monastery of Kfifan, he contracted pneumonia and died. 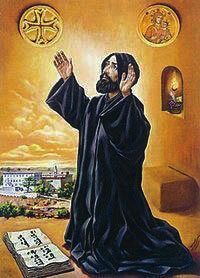 Saint Nimatullah, help us to be conscious of God’s presence with us always.